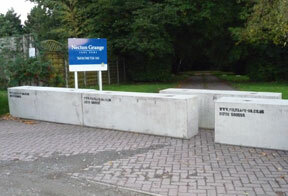 Buy or hire concrete barriers to stop casual as well as nuisance trespassers, or control vehicle access, with a simple and maintenance free solution. None of us like criminals or indeed the general public trespassing on our land or property – what may be seen as harmless access can cause the property owner irritation, and possible damage and mess to clear up. If you wish to stop vehicle access only, we can place the concrete barriers with a small gap between them – this protects your land, but maintains pedestrian access. 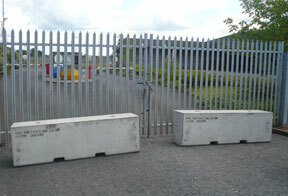 You can buy or hire these barriers. Polysafe concrete barriers are manufactured to the highest standards in a range of sizes and variations to suit your needs. Visit our before ordering and site preparation pages for advice on placing your order. Alternatively, if you would like to speak to someone directly call our sales team on 01778 560555.